Learning Mandarin Chinese through TV. If the plot is good, the cast attractive, and the narrative well paced, before long, it’s not just a matter of learning Chinese any longer… you’re suddenly motivated to learn Chinese just to understand what’s going on! But if you haven’t really watched Chinese TV before, how do you know where to get started? What should you watch? In this post, I want to share with you my top techniques for learning Mandarin Chinese by watching TV, as well as my list of top 13 Chinese shows for learning Chinese. How do you actually learn Chinese through TV? It’s not enough to just soak up the vocabulary. Using a film to improve your Chinese means watching it actively rather than just sitting back and enjoying. If you hear an unfamiliar word, write it down. Make sure you look up the words in a good dictionary and then review them on a regular basis. This is an effective approach, but like many real things in life, it is going to take time and energy. If you’d like to be even more efficient with this, you might want to check out FluentU, our site for learning Chinese through videos. FluentU was designed to address exactly this problem. 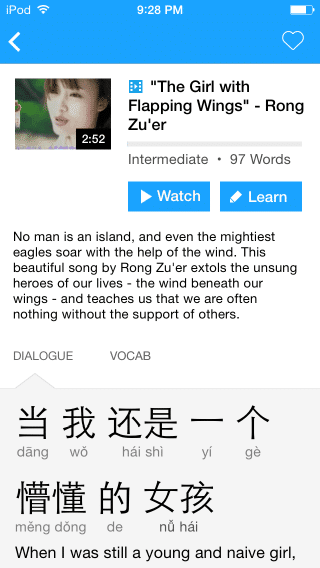 FluentU brings together great videos for learning Chinese in one convenient place. 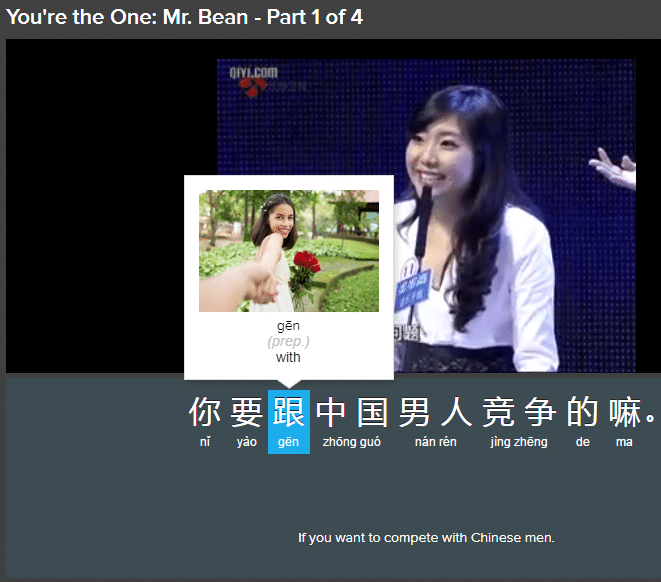 It also provides interactive transcripts and a video player designed for learning Chinese. It tops this off with a review system which takes full advantage of the massive video library. And FluentU remembers your progress in learning vocab and uses it to recommend content from the rest of the FluentU library, which includes real-world videos like movie trailers, commercials, news, and inspiring talks. Okay, next, you might be thinking—what was my criteria for picking? First of all, it had to strike a balance between being a good quality drama to watch and being a show where you can actually learn Chinese. In order to do this, I tried to gauge these dramas on a difficulty scale, and I used the idea of assigning difficulty based on genres. Specifically, I’ve divided the 13 Chinese TV shows into three distinct categories of increasing difficulty: romance, family and Imperial. In my personal experience, TV shows in the romance genre are the easiest to understand. And if you think about it, it kind of makes sense, doesn’t it? Between lovers and couples, only the simplest of words are necessary to express your emotions and thoughts, which really fall under the scope of questions like “what’s happening in life,” “how’re you feeling” and “what would you like to do.” The result? Simple, easy to understand language. On top of that, variety talk shows / game shows are also pretty good to start with. Apart from the occasional joke where I just don’t get the humor, conversations between the hosts and the guests are usually light, entertaining and simple enough to understand. Finally, where can we be without our Imperial dramas? Of the three, Imperial dramas are undoubtedly the most difficult to understand. There are often idioms thrown into the mix, and sometimes, you simply won’t know a lot of these words, because Imperial dramas are based in ancient China, where classical Chinese is used. Of course, for modern interpretations on screen, modern Chinese is used, but not without throwing in an idiom here and there first. Also, I tried to be realistic. Unfortunately, even if you watch the simplest types of TV shows, you will have to have a certain proficiency in Chinese before being able to understand what’s going on. Because of that, I have to recommend that your proficiency be intermediate (you have a good range of basic words in Chinese) before watching these shows. Otherwise, you’ll be struggling to even understand basic sentence structure, basic vocabulary—which defeats the purpose of learning some Chinese and actually enjoying the drama at the same time. Learning Chinese through TV shows is not for the faint of heart—but it’s certainly fun when you have a good Chinese foundation. With that said, here’s my top 13 TV shows to learn Chinese with. Let’s dive straight in. The story starts by introducing us to a plain Taiwanese girl who works in a plain office with plain looks with a plain personality, and even a plain name (陈欣怡). She falls in love with another fellow office worker, but who is really only taking advantage of her by using her, having her clean his home, pay his bills and so forth. Ignorant of this, she goes on a trip with him on a cruise and one night, accidentally goes to the wrong room and sleeps with the wrong guy. After clearing the misunderstanding, and praying that they’ll never meet again, 欣宜 returns to her old life. Watch as the series of missteps, misunderstandings and reluctance blossoms into a story of real love in the unlikely turn of events. A romance drama which is also incredibly funny…highly recommended! A touching love story which starts off with the main character, 任光晞, a son from a wealthy family, materialistically well off, but spiritually empty, who passes every day without much purpose. After witnessing his own parents’ failed marriage when he is a child, he bears a deep mistrust for women until one day, he meets a simple delivery girl, 梁慕橙, who also has a complicated past. She comes from a wealthy family who later goes bankrupt, leaving her to do odd jobs on her side to survive. Through a series of frequent encounters, the pair falls in love. Having found someone he can confide in and genuinely connect with, 光晞 overcomes his distrust of women. Just as love permeates through the air, a routine medical exam reveals a brain tumour in 光晞’s brain. Through a series of events, he miraculously gets better, but at a heavy price: the love between 光晞 and 慕橙 vanishes into nothingness from a bout of amnesia after being operated on. The real love story begins. A story about a hidden romance between a an architect, 宋修杰, and a celebrity, 艾薇, where the latter wishes to keep the relationship quiet, to the increasing dissent of the boyfriend. One day, a hotel room service representative stumbles upon them and helps them out of a tight spot by pretending to be the architect’s secret lover in front of the paparazzi, allowing 艾薇 to slip discreetly out of the room. After the incident is publicised across tabloid magazines, 艾薇 proposes that they continue this “fake marriage” until she finishes her current film work, after which she will be ready to accept 修杰’s advances. 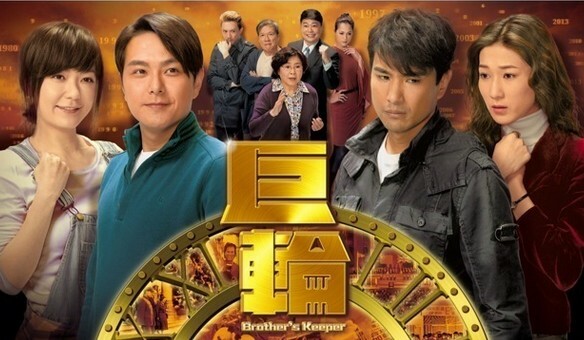 A Hong Kong drama that tells the story of a pair of half-brothers born in Hong Kong, but due to the mother losing her temper and tearing up the elder brother’s birth certificate, both brothers have no choice but to follow her back to FoShan, where her mother comes from. In the 1980s, they become stowaways on a journey to Hong Kong, but become separated along the way. The older brother manages to reach Hong Kong, while the younger brother reaches Macau with his father and mother. With the determination of realizing their dreams and making a name of themselves, they work hard, the older brother later becomes a Hong Kong policeman and the younger brother starts a snacks shop that is growing increasingly successful. Through a series of circumstances, the estranged brothers are finally able to reunite, and they rejoice at being able to become family again. Just as things are sailing smoothly, the older brother makes a series of bad decisions and lands himself in a precarious position, and is in the verge of losing everything in his life that he fought for. A drama based in Hong Kong, this story starts off with a couple who dreams of opening a travel agency, but later goes bankrupt after being cheated out of hundreds of thousands of dollars by a crime syndicate. 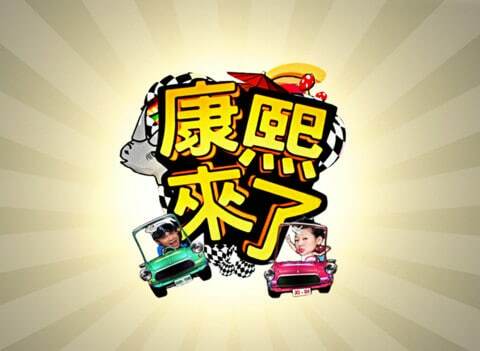 This story follows the colourful cast of the protagonist’s wife, who falls in love with his best friend; his younger cousin, who comes from DongGuan to Hong Kong with the dreams of becoming a singer; Monroe, an old diva who now lives by conning people for food and living necessities; his own younger sister, who recently completes her Master’s degree secretly behind his back and returns from Taiwan. The story is centered around the theme of the conflicts between mainland China and Hong Kong. A rare comedy that is culturally insightful and full of comedic fun with a large musical component and lots of singing. 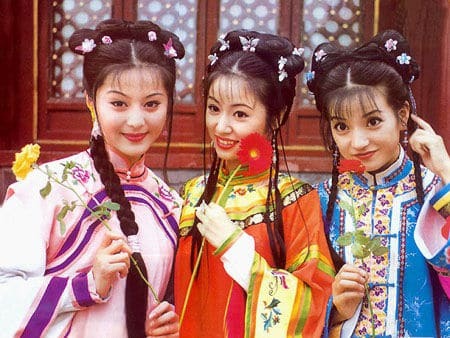 One of the most widely acclaimed TV shows in Hong Kong of all time, “Rosy Business,” in English, is a drama set in the Qing Dynasty. It follows the story of a wealthy family that operates one of the largest rice trades in the entire China region. The story starts with the encounter between an Imperial cook of the royal palace, 康宝琦, who follows a high ranking official from the Imperial court on a mission to resolve a rice shortage crisis, and 蒋喬, son of one of the largest rice merchants in China at the time. The two fall in love, but through a series of events, are separated, and against his will, after having vowed marriage with her, 蒋喬 is forced into marrying another woman by his father’s recommendation. Centered around the themes of family, love, and betrayal, the story follows the interactions between the individual members of the wealthy family—the first wife, 殷凤仪,who is cunning and devious; the second wife, 彭嬌, who is honest and blunt but stubborn; the third wife, 刘芳, who is kind but never stands up for herself; and later, the fourth wife, 宝琦, 蒋喬’s original lover with whom he was estranged many years ago, and their respective sons, as well as the continual power struggle between the four to take over the family business. A must watch for those who are interested in Imperial China, but not the backstabbing elements in the palace harem. 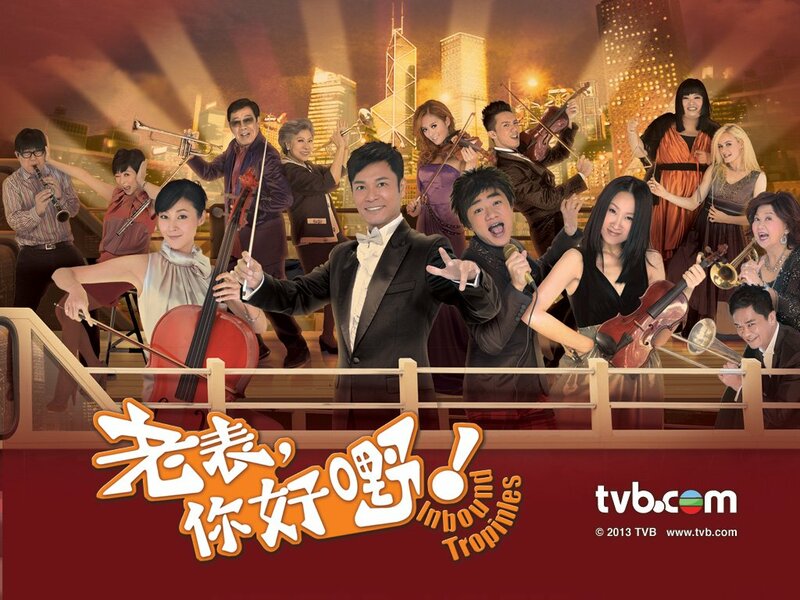 This is yet another classic TV series in Hong Kong. Set in modern Hong Kong, the story is centered around the themes of family, love, friendship, jealousy and wealthy socialites. It starts off with flashbacks of the past, where the protagonists, a couple, 钟笑荷 (nicknamed 荷妈) and 甘泰祖 (nicknamed 祖包), who are owners of a small, upcoming bakery, witness a deterioration of their relationship because of the husband cheating on the wife with another employee, 殷红, in the store. Pained by his betrayal, coupled by the fact that it was 荷妈 who took in 殷红 and treated her like a sister when they came to Hong Kong as stowaways in the early days, she leaves her husband. A court battle ensues between the couple to settle custody between the six children in the family. Many years later, 祖包, now with 殷红, have become billionaires from decades of expanding their businesses and taking it public, and 荷妈, hard working mother of three, remains in the small shop that they started many years ago, with her children helping her out. In this drama, the story is set in ancient Beijing, with the protagonist, 小燕子 (Little Swallow), who makes a living through street performances and being a con (wo)man. Once, during a facade where she creates an uproar exposing a corrupt official of forcing another woman into marrying him, she meets 紫薇, a well mannered girl with whom she gets along with immediately. The two later on toast to be sisters (结拜姐妹), as it was customary in ancient China—before 紫薇 reveals a shocking truth about her true identity. She is actually the illegitimate daughter of the then-incumbent Chinese Emperor 乾隆, who reveals her true purpose for coming to Beijing: to reunite with her real father, the emperor. Once, however, through a series of misunderstandings, 小燕子 is taken into the palace instead of 紫薇. And even though she tries on several occasions to clear up this misunderstanding, she is always stopped abruptly by some unforeseen circumstances. Frustrated, she holds off telling the truth for now. 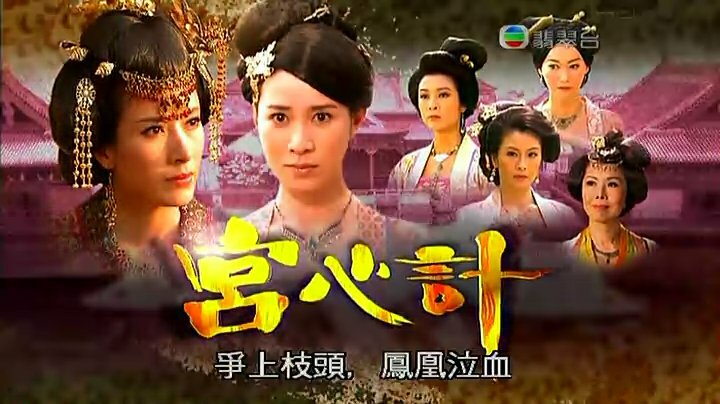 In the palace, after meeting with the princes, who learn the truth behind Little Swallow’s identity, they help sneak her out of the palace during midnight and she reunites with 紫薇ZiWei, who is completely unfazed about the misunderstanding, and is grateful she can meet 小燕子Little Swallow again, albeit under such unfavourable circumstances. A must watch for those who like Imperial dramas, but instead of just sinister plotting against each other in the palace, there’s a fair bit of comedy in the story, and remains up to date China’s most successful drama series, a record that has held for over a decade and a half. A drama from Hong Kong, this story is set in ancient China, where it tells of a family, both parents, 刘松柏 and 江采瓊, their three year old daughter, 刘三好, and three year old handmaid, 姚金玲,who is separated because of the outbreak of a war. The father is killed in action, while the mother, and the two children are enlisted into the palace as handmaids. Known for her skill with making jewellery, the mother is sent into the faction of the palace responsible for handling the making of jewellery for the empress and Imperial concubines. The Empress of the time, 郭太后, is an all encompassing, powerful individual but with a huge ego and a sense of ultimate superiority, who constantly mocks one of the concubines at the time, 郑太妃, for being born a mere hand maid responsible for washing the empress’ feet, and not of royal blood. 郑太妃, fearing for her son, 李怡’s, safety in the future battle for the throne, fakes her son’s injury into becoming a mentally retarded boy and is granted haven by being sent away by none other than the Empress herself, from whom she is trying to protect her son. Once, while sitting near a fire for warmth, a personal hand maid remarks to 郭太后 that a piece of jewellery on her head drips wax, as if it is bleeding. Enraged and fearful of this omen, she punishes 金玲, who hand crafted this item, and coupled with a heavy cold, she passes away soon after, leaving behind 三好 and 金玲, the two who later become best friends. As the two grow up, they rise through the ranks of the Imperial harem as hand maids. As the plot thickens, however, the story follows the growing distance between the two friends’ relationships, and it can only seem that the Imperial Palace is a place where people’s true natures manifest in real life. An Imperial drama with a very different flavour than the previous two, set in the Xi Han Dynasty of China, the story follows the female protagonist, 杜云汐, who is on the run with her mother for being involved in a series of affairs in the palace harem. In her days in the palace, the Empress at that time is plotting to kill another concubine in the palace, for fear of her son’s throne being threatened and eventually usurped. 云汐’s mother, hand maid at that time to that concubine, discovers a poison sent by the then-Empress to kill her. Fearing for the concubine’s safety, she informs her master, who arranges for her to escape the palace, but not without a brutal chase from assassins sent from the palace, resulting in her eventual death, who jumps off a cliff. With nowhere else to go, the young 云汐 seeks refuge at her aunt and uncle’s, neither of whom are originally willing to take her in, and who make her upbringing a miserable one. Facing their constant spite, 云汐 learns to be witty in dealing with people, and her resourcefulness to survive is shown through many pressing circumstances and dangerous situations, training her into a clever young lady. When she grows up, as fate would have it, she is once again embroiled into the sinister affairs of the Imperial palace harem. Knowing that she will constantly be in danger, she changes her name to 窦漪房, and through her wits and cunningness, she manages to turn a potential enemy, the current Empress’ grandmother (the then Empress’ in her mother’s times), into one of her benefactors, who takes a liking to her because of her unprecedented wits and cleverness. Seeing that, the Empress’ grandmother send her to be married to 刘恒, the son of the then-concubine who 漪房’s mother tried to save but fails, sending her as a spy of all sorts to monitor the mother and son, who didn’t manage to escape the palace back in the days but survived to live the day. Trapped between her conscience and her responsibilities, 漪房 must use every ounce of wit she possesses to get herself out of thorny situations. As her power and influence in the palace grows, however, YiFang finds the relationships with those she holds dearest to herself drifting apart, as well as the list of enemies plotting against her increasing. A touching story centered around a female heroine whose name, for the brilliance she exudes and whose presence eventually influencing the fate of the entire nation, would be forever engraved in history. 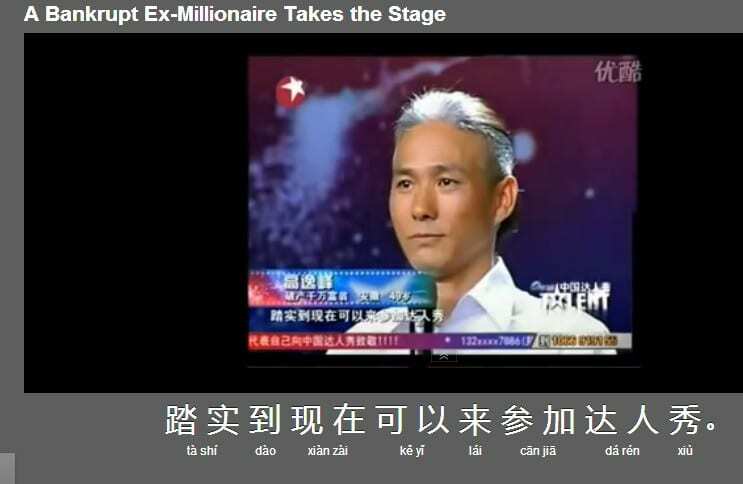 While KangXi Lai Le is actually a talk show, I think it’s still worth mentioning in the context of this list as my surprise bonus TV show to help you learn Chinese. The reason I feel like throwing this in the mix is because it’s just that good—it’s hilarious, it’s addictive, and you feel like you learn something interesting from watching it, from an entertainment perspective. 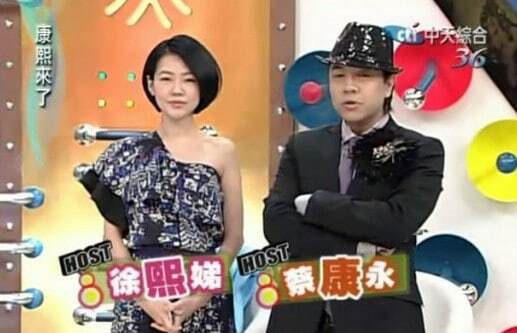 The hosts of the show, especially the female host (小S), are notorious for talking about the most controversial questions that nobody other hosts dare ask and shed light on topics in a remarkably fun and entertaining way that makes both the show participants and the audience feel relaxed enough to pipe into the conversation. Example episodes include people who’re obsessed with taking self portraits, or 自拍 in Chinese, and how different they are in real life; people who’ve had plastic surgery; celebrities who are raised abroad and their experiences overseas being Chinese; interviews with celebrities talking about the most sensitive topics, etc. Each episode delivers something that’s really topic worthy, so don’t be surprised if you get hooked on after a while. One thing I will say about the show is that episodes aren’t subbed. This means that you’ll have to rely on your raw listening skills to understand the content. But since they’re light and entertaining, and most of the times, the language used is straightforward, it shouldn’t be a problem for intermediate or above Chinese learners. This show is loosely based around “Take Me Out,” where there are around 30 female guests, and about 4 – 5 male contestants every episode. During each segment, small clips of videos are played to the female guests, and the hosts talk to the male contestants about their hobbies, preferences and the like. All female guests are given a buzzer, and if they don’t like what they see, they can always hit the buzzer. If all female guests hit the buzzer, the male contestant is eliminated from the show. This is one of the most controversial game shows in China, where female guests can sometimes become the spotlight of mass media attention from being pretty haughty in their mannerisms. But if you like a good dating show, this is as good a dating show as any in mainland China. “China’s Got Talent”: Available on FluentU. Great… So Where Can I Watch These Chinese Shows? If you are not that picky about selection, but would like to learn with these shows effectively, then you should definitely check out FluentU. All the videos come annotated. Each word is accompanied by useful images and definitions. And you can review each video with a “learn mode” that teaches you each word using clips from other videos. With that said, because of the work that goes into annotating the videos, you aren’t going to find all the episodes for each of these shows. If you want to watch a all of the episodes, you have a number of options. However, for Hong Kong and Taiwan dramas, these websites block users from outside the country. That means that you’ll have to look for alternative solutions—I’ll try to outline two here that you can consider. The first solution is via P2P websites, one of my favourite ones is Funshion, unlike its streaming counterparts like Youku and Tudou, Funshion actually allows anyone from anywhere to watch all TV shows and movies without restrictions. One thing about Funshion I’ll throw in here is that if possible, choose Funshion mobile over Funshion desktop. I have no idea why, but Funshion on your desktop has quite a bad rap from people in the past. Funshion on an iPad or an Android tablet, however, is much smoother and doesn’t present much problems you’d be surprised at the difference between the desktop and mobile versions. It’s really software that “just works.” I’d recommend it! The second option is to get VPN that allows you to access these streaming websites in China from a Chinese server location. That way, geographic restrictions are lifted, and you’re free to access these blocked dramas. However, if you’re familiar with using VPN to access blocked websites, you’ll know it doesn’t provide a good experience for streaming videos. But you never know—you might be lucky and find a service that provides a smooth streaming experience. Third of all, there are some sites that offer subtitled Chinese dramas (subs are in English). For instance, Viki is a community powered site where subtitles are crowdsourced to website members. Other websites include DramaCrazy.eu, Alodrama.com, Hulu.com, MySoju.tv, Dramafans.org, Drama.net. However, the problem with these sites is that they link to video mirrors, instead of hosting them on the site (which is prohibited as you know). This means that these mirrors can sometimes be taken down over time or stop working altogether when the video hosting sites encounter issues. Another observation I made is that usually between Chinese and English subs, Chinese subs almost always seem better. It sounds obvious, but you’d be surprised how much of a difference it makes. You might also be disappointed by the fact that these websites that host their videos elsewhere offer a smaller selection of Chinese drama titles. With this in mind, I highly recommend starting with Funshion, before trying other alternatives. I would be remiss not to mention our app. The FluentU app takes the best of the website and makes it mobile. It takes real-world videos like music videos, commercials, news, and inspiring talks and turns them into Chinese learning experiences. It uses a natural approach to ease you into learning Chinese language and culture over time. You’ll learn Chinese as it’s spoken in real life. 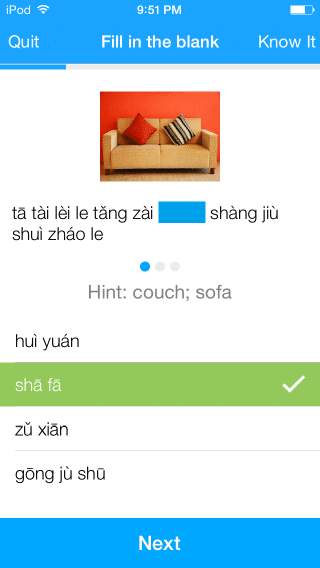 The app makes native Chinese videos manageable with interactive transcripts. Tap on any Chinese word to instantly look it up. Every definition has examples that are written to help you understand how the word is used. You can also add words you’d like to review to a vocab list. And the app has a learn mode that turns every video into a language learning lesson. You can always swipe left or right to see more examples for the word you’re learning. The best part? The app keeps track of your vocabulary, and it recommends videos and examples according to the words you’ve already learned. You’ll have a 100% personalized experience.